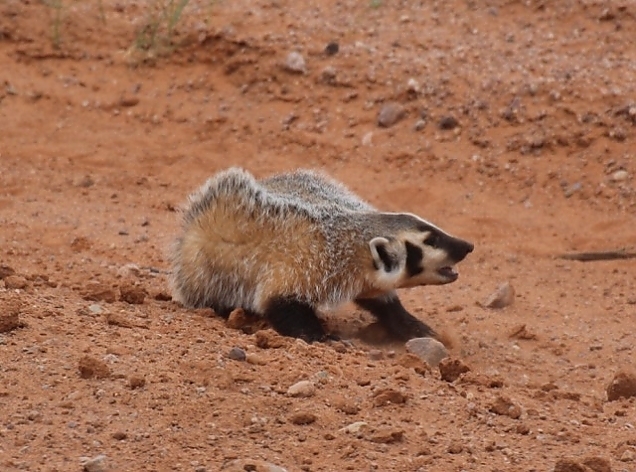 Among the vast number of critters we enounter up here, ranging from the big un's like moose and elk to the tiny midges and mosquitos, are badgers. The other day, Lynne and I were driving back from Laramie and were along the sandy stretch of road just beyond the cattle guard at Chimney Rock Ranch. You locals know where I mean. I saw a mass of wiggling hair making its way along the right side of the roadway. It looked to be about 3 feet wide and a foot long. It was moving as a single unit--or appeared so since it wobbled back and forth and up and down in a steady rhythm. At first, I was not sure what it was but knew it was going to be interesting, so I told Lynne "get your camera!" As she reached for it, she also saw the bobbing blob of hair, but by now we were closer and could see that it was four distinct critters. Two little ones in the middle flanked by bigger ones to each side. It was a family of badgers! As we slowly approached closer, the male badger peeled off the group and began running straight at the truck. 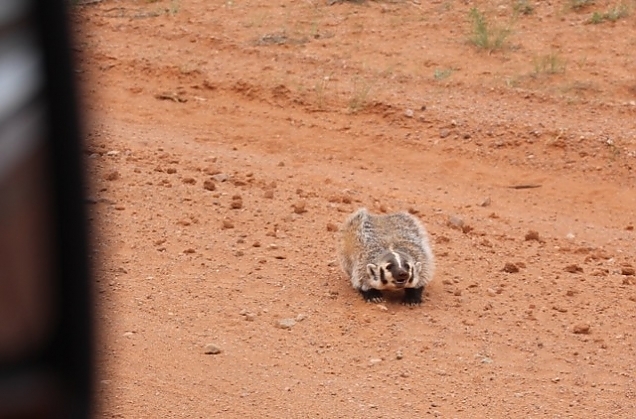 This is a 10 pound badger ready to attack an SUV! Here is a photo. That is the side view mirror at the left of the photo. Lynne took this as he charged us. Mom and the babies continued to wobble down the road a bit, crossed it, and made their way into the bushes and brush along the road side. Meantime, dad, who was so close to the truck I could not see him let Lynne know that he was ready to eat us alive. He stood his ground, hackles up, swinging his head from side to side and hissing and growling loudly. You can't see them very well in either of these photos, but his claws are easily and inch and a half long. This is one ferocious creature that I would not want to encounter, especially if he thought I was a threat to his family. I continued to drive slowly and he gave chase. When I eventually saw him behind me I sped up a bit. He finally gave up the pursuit, crossed the road, and disappeared into the brush to join his family. Follow our adventures living in an off-the-grid cabin in remote Colorado. Kind of like reality TV on a blog! If you’re new to this site please visit the archives to catch up. Marsha, I’m afraid not. We won’t be blogging anymore! We need more privacy! All photography and text on this web site is copyright. For use or reproduction please ask us first.